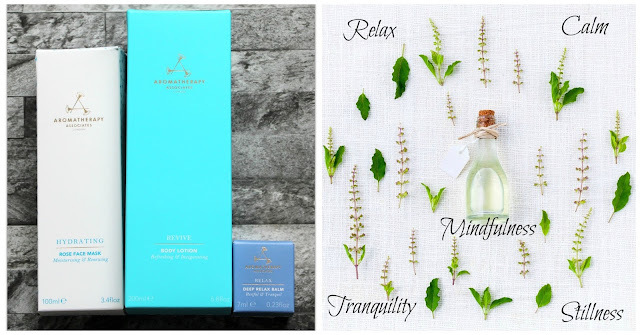 Aromatherapy Associates is a brand I've loved for years, starting with their essential bath oils many years ago; divine scents in a bottle, that instantly help relax my mind and body. If you want to read my review on the essential bath oils have a look here. Over time I've been lucky enough to try other products in their range. They have been so lovely that I thought I would share them in a post with you. In the winter I suffer with very dry skin. If left to its own devices it becomes dry, flaky and I suffer from rosacea. For the last couple of months I have been using this face mask once a week. It smells divine; Rose, Bergamot and Geranium enriched with Aloe Vera and Chamomile, it's wonderfully hydrating and a perfect pick me up for my skin. During the winter I get these annoying little bumps on the top of my arms. I have no idea what they are but this little beauty is wonderfully moisturising and makes my skin look noticeably smoother. The Shea and Coco Butter soften and brighten my skin and the essential oils of grapefruit, juniper and rosemary make you smell divine, good enough to eat. Since having Noah relaxing has gone out of the window. In part because I used to have a relaxing soak in the bath as my means of unwinding and with a little one in tow, long lazy soaks are definitely a thing of the past.That is where this little beauty comes in. Even the art of opening it up and smelling the essential oils of Sandalwood, Chamomile, Bergamot, Ylang Ylang bring a reassuring sense of calm. It is an ideal size for my handbag and helps to gently soothe my mind. Have you tried any Aromatherapy Associates? Or other beauty pick me ups? Let me know in the comments below. Since the birth of Noah, going out for meals as a couple have been a scarcity. But as Noah is getting older it is becoming far easier to sit down and enjoy a meal with the little man in tow. As a foodie I have really missed eating out and as a consequence have created quite a long list of restaurants that I want to try. Well I have been dreaming of food offerings for well over a year. 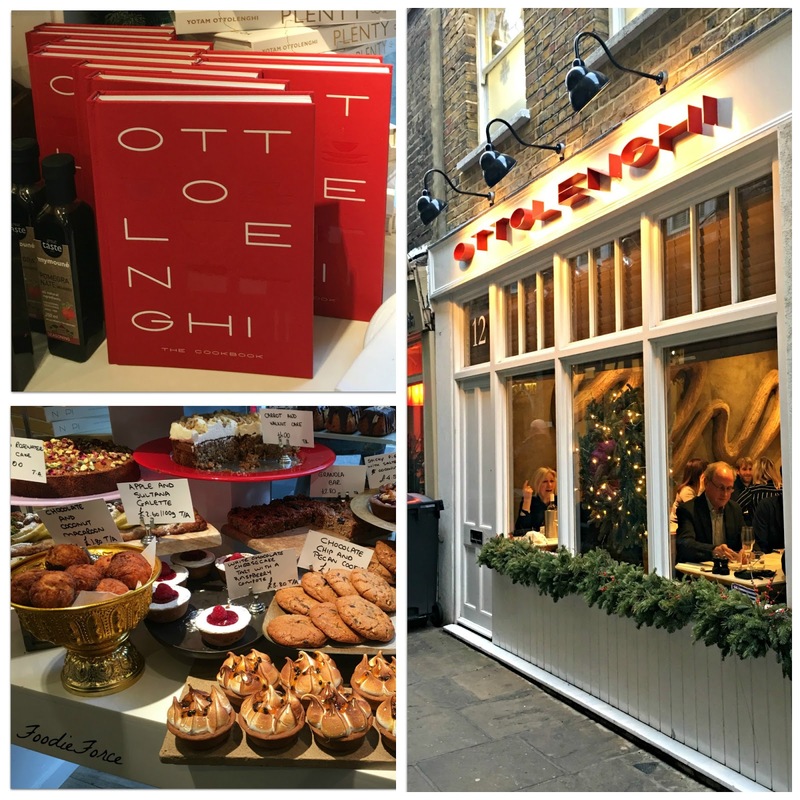 Last month the restaurant abstinence was broken with a visit to Ottolenghi in Spitafields. 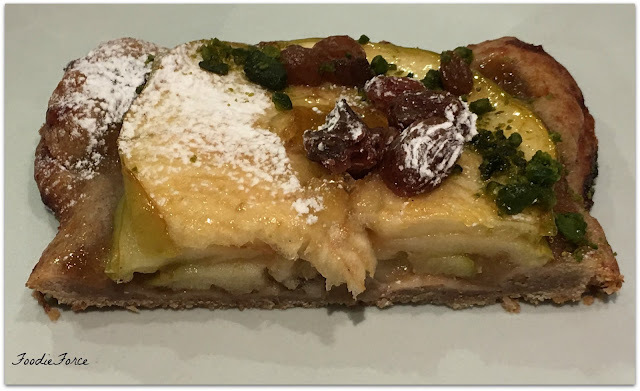 Hidden down a side street away from the hustle and bustle of the thriving market, Ottolenghi's window of cakes is positioned beautifully to entice you in. The menu whilst concise offers creative food utilising exciting ingredients. Salads here take centre stage, now before you turn your nose up the salads here are wonderfully fresh, using imaginative ingredients and offer an interesting change to the usually stodgy wintry accompaniments that come with some meals as an afterthought. I was a little bit disappointed that starters don't exist here but the mains more than made up for this. Here you have the choice of hot mains which come with two side salads (£21.75). Cold mains from the counter with two salad accompaniments (£15.70) or a selection of three or four salads on their own (£12.90/£15.50). The menu offered quite a few mains that I would have happily tried. I settle in the end on the cod cakes in mint and tomato sauce. I'm pleased to say that the fish cakes maintained their crispy outer crust with wonderful moist flakes of cod despite being in a tomato sauce. The sauce whilst nice had no taste of mint and was reminiscent of tomato passata; but the fish cakes had more than enough flavour that this didn't really matter. To go with my main I chose toasted Orzo pasta, red onion, sundried tomato with goats cheese and hazelnut salad. I really love Orzo pasta and the addition of soft gooey goats cheese and crunchy hazelnuts was the perfect addition. My second salad was green beans, mangetout, pickled cucumbers, mustard seeds, chilli and peanuts. Whilst this was nice it wasn't an amazing salad. Friends settle on the pan fried grey mullet with pickled beetroot and sunflower seed salsa. I am reliably informed that the mullet was cooked perfectly and the addition of the beetroot really added to the dish. The only complaint was that the portion size was just not sufficient as a main. I would have to agree that at a £21.75 price tag this main was overpriced with the serving more reminiscent of a starter. The remaining member of the table opts for sun-dried tomato and ricotta croquettes with basil and lime yoghurt. In comparison to the mullet the croquettes were huge in size. I am told these are delicious. 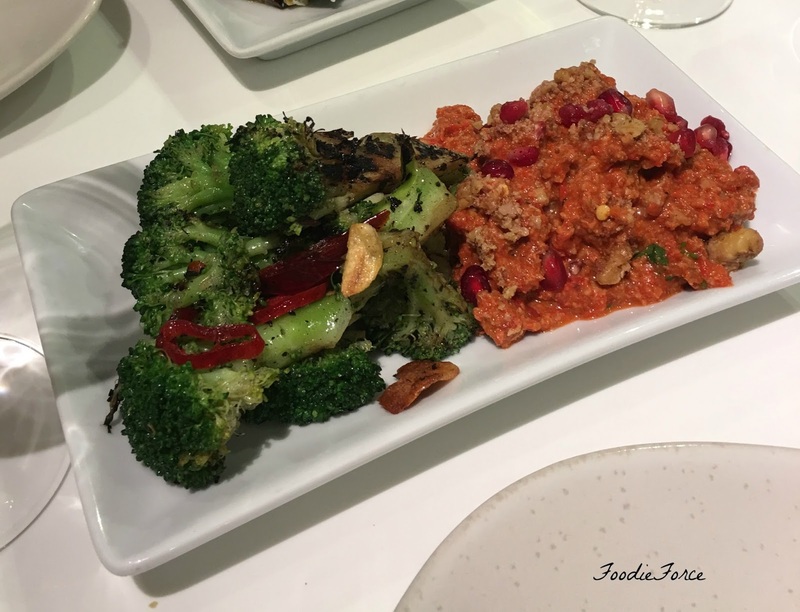 The two salads of choice to accompany the croquettes char-grilled broccoli with chilli and garlic. Hummus, with zhoug, crispy chickpeas and roasted peppers. The hummus with the pomegranate is an absolute delight an explosion of flavours. If your interested in making some Ottolenghi salads yourself at home have a look at their website for some divine inspiration. Our mains went perfectly with a cold crisp bottle of Barbera Bianca, Castello di Cigognola (£35). I really enjoy Italian wine and this bottle was wonderfully fruity perfect with the fish and goats cheese in the salad. The star of the show however has to be the desserts. I will be dreaming about these for quite a while. I instantly knew what I wanted passion fruit meringue . 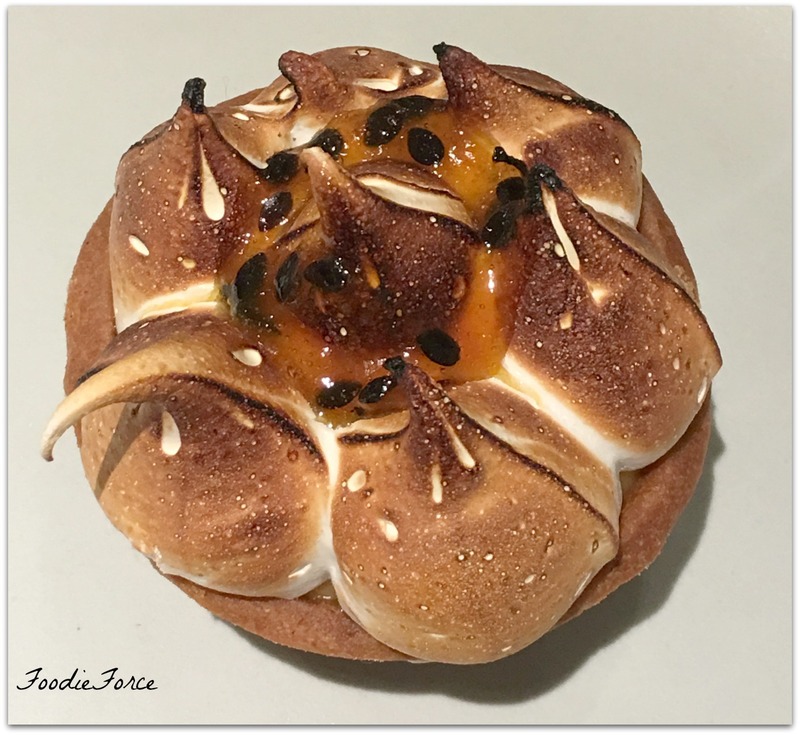 This was the perfect combination of sweet from the meringue, pastry, mixed with the tartness of the passion fruit. Definitely one of the nicest dessert I have had in a while. The wonderful thing of dining with friends is you get to sample all the desserts. 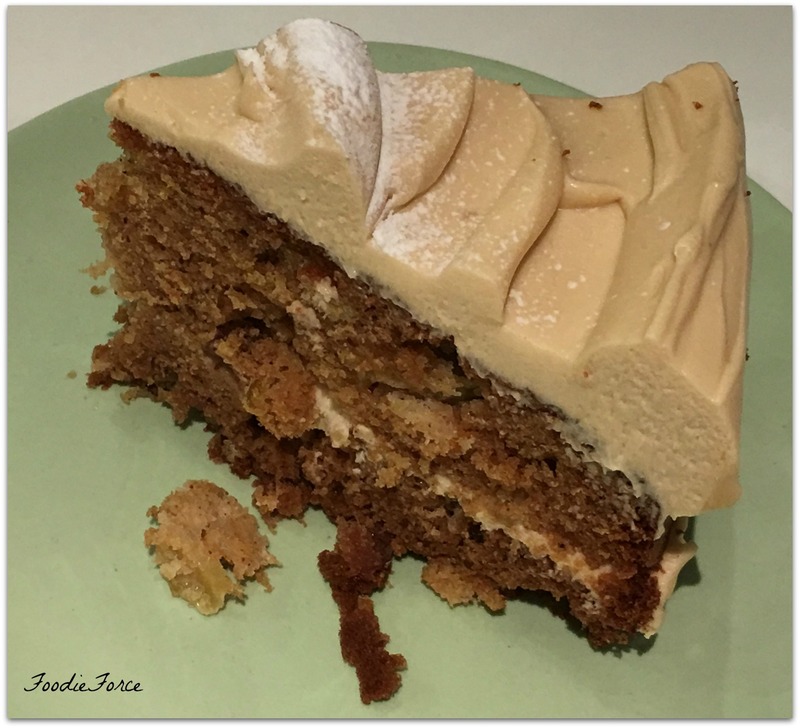 Next up was carrot and Walnut cake with cream cheese icing (£5.50). The cake was lovely and moist but best of all was the quantity of cream cheese icing. No scrimping here. Next up was Vanilla Financier with plum, mixed berries and poached pear (£5.50). 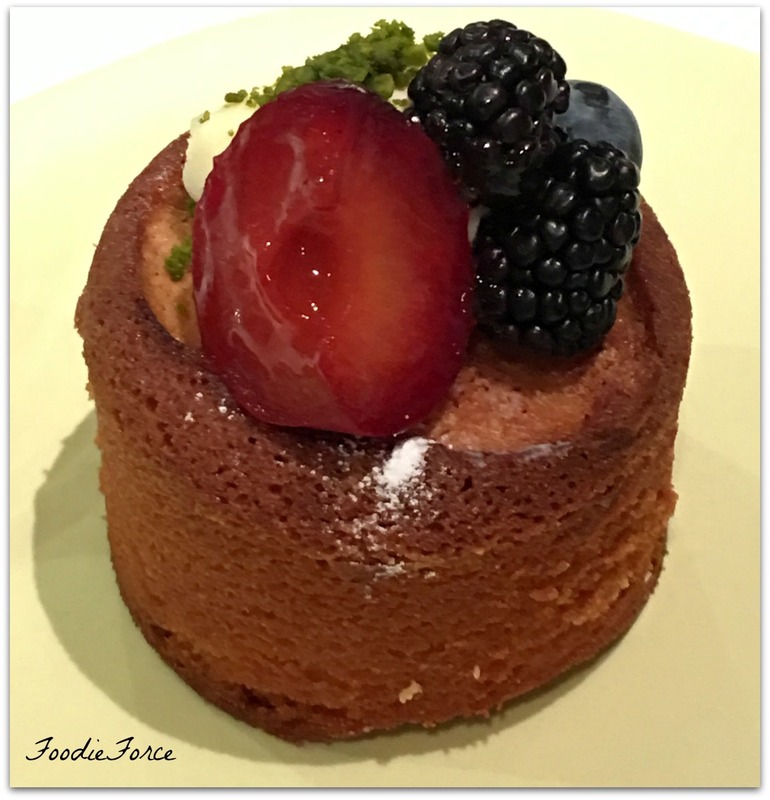 The sponge was deliciously moist and the tartness of berries against the poached pear yummy. Last in our dessert offerings was apple and sultana galette (£5.50). Now whilst I wouldn't have picked this myself I am reliably informed it was delicious. So there you have it, Ottolenghi offers a relaxed family friendly restaurant, with good food and service if you love your salads and smaller portions. The temperature in London has certainly dropped over the last couple of weeks so salads are off the menu for now. Any other good foodie suggestions to add to my ever growing list?